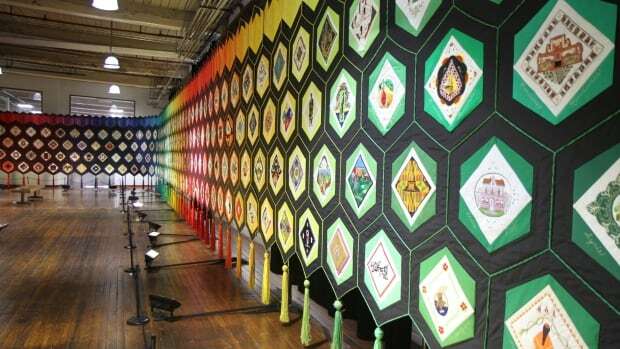 Last week I visited Hamilton to see an exhibit ‘Quilt of Belonging’, which is 120 feet long and ten feet high. This AMAZING piece of work is made of 263 hexagonal blocks about 6 inches, with each block representing Canada’s main Indigenous groups, or a country from which immigrants have come, with a depiction of something from their home country, or what Canada means to them. The bottom row, the foundational one, is from main Indigenous groups. The creativity and ingenuity displayed by the artists are phenomenal. Few of the blocks are quilted in the traditional way, rather they are a display of embroidery, appliquéing, tatting, beading, and other kinds of textile art. The exhibition runs from July 10 – August 16 and is free. Guides are available to explain some of the blocks. My friend bought me the book that shows each block and explains why the artist depicted the country that way. For example, France has a petit point oval about 4 inches long and about 3 inches wide—depicting a scene in the Impressionistic style. This sits on a square with Richelieu cutwork embroidery. The Canadian block is an incomplete maple leaf, outlined in beadwork. The quilt shows the diversity of the cultures of Canadians, both new and old. 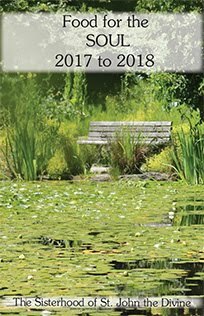 Though it has been around for more than 10 years, the showing is particularly important in this year of Canada 150. The incredible journey of making this project is a testament to what can be achieved when ordinary people work together with hands, heart and spirit for the good of all!